and generally have a good time. Contribute if you will, but do so respectfully. Principle number 5 applies here. Before you start a new business, create a new product or tackle a new project that will effect your future, ask yourself these five questions. Have you ever tried to give directions to someone who’s lost? You can’t until you figure out where they are. The same is true with business. Before you can make progress you must be your the starting point. Create a clear picture of the present, your position in the market, your assets and challenges. Only then can you create a roadmap to your goal. Who cares about your product or service? Who cares if you succeed or fail? Who cares if you take a risk? Who cares if you create a new business model? Identify those that matter and develop plans to make them happy. You may find that the only person who really matters – and the only person you have to please – is you. Don’t assume you know everything. As you move forward, you’ll learn. You’ll be challenged. The landscape will change. You’ll need to alter your course. Be ready to see the future as it emerges, not just as you have envisioned it. In every journey there are milestones. Know what they are so you can track your progress and make the adjustments necessary to get back on track. Are you on schedule? Do you have the resources to make it to the next milestone? Has anything changed to make you rethink your course? If you spend all your time asking why, you’re looking for reasons not to do something. Ask why not and you’ll begin to remove those barriers. Then you can start moving forward. The difference between good and great isn’t a big idea. It isn’t breakthrough technology. It isn’t a billion dollar launch campaign. Nor is it the celebrity you’ve hired to endorse your product. The difference between good and great lies in the details. It’s in the curve of a surface. It’s in the simplicity of the interface between your device and the server. It’s in the elegance of your code. It’s in the feel and placement of a switch. It’s in the ability of a salesperson to remember a new customer’s name. It’s in the casting of your commercial. It’s in the editing of your newsletter. It’s in the the quality of your images. It’s in the kerning of your type. Great ideas are a dime a dozen. Excellence in execution is the most important determinant of success. It’s what separated iPod from Xume, Ford from Chrysler, Avatar from Land of the Lost. In a time when consumers have more choices than ever, good enough just isn’t good enough. You have to sweat every detail on your great idea. People are not interested in shelling out their hard-earned pay for mediocrity. If you’re not willing to go all the way to great, you might as well not even start. There is a lot of advertising out there: on television, in print, on the web, embedded in games, billboards, sponsored tweets, direct mail, vehicle wraps, tattoos, sweepstakes and believe it or not, people are still producing radio ads. While the ultimate goal of all marketing communications is to drive sales, each piece of communication has – or should have – one objective, one reason for being, one goal it’s trying to achieve. This singular focus is what makes an ad powerful. It also makes life easier for the agency team and the client. The challenge often becomes agreeing on one objective. Along with the proliferation of media it seems there has also been a proliferation of objectives. Phrases like, “create buzz” “spark engagement,” “leverage our network,” “enhance our pop culture cred,” and a lot of other nonsense appear all the time in Ad Age and Adweek. Too many campaigns seem to lack a clear idea of what they want the viewer to actually do. Awareness is great. Affinity is great. Facebook “likes” are great. Twitter followers are great. Brand esteem is great. Ultimately, however, it’s all about action that generates revenue. If your ‘buzz’ isn’t connected to an objective that makes the cash register ring, it’s worthless. Is Burger King’s present Arby’s future? Yesterday it as reported that Wendy’s passed Burger King as the second largest hamburger chain in the U.S. in annual sales – $8.5 billion versus $8.4 billion – even though Burger King has 1,500 more stores. What does this have to do with the future of Arby’s? A few months ago, Arby’s hired Burger King’s former marketing director, Russ Klein. He promptly fired BBDO, the advertising agency who’s work contributed to five consecutive quarters of growth for Arby’s. With whom did he replace BBDO? CP+B, his former agency Burger King. They were fired after his departure and six consecutive quarters of declining sales. If the definition of insanity is doing the same thing over and over again expecting different results, then Arby’s executive team needs to spend some time on the couch. That’s great. Awards are nice, but the true value of an agency/client partnership must be measured at the cash register. Subservient Chicken got a lot of views and praise from the ad industry, but how many chicken sandwiches did it sell? The Whopper Lust campaign got press, but giving away your signature product for free is not a recipe for profitability. I realize that marketing isn’t the only contributing factor in Burger King’s decline, but unless the Klein and CP+B are more disciplined strategically and focus on the things that truly drive business instead of clever but irrelevant marketing tactics, why should we believe the result of their partnership will be any different at Arby’s. You, yes you can become more creative. I just spent the weekend finishing up Idea-Links, a book on creativity written by my friend and colleague, Jim Link. Jim is an innovation consultant who leads new product development programs for companies all over the world. I was lucky enough to meet him when we were asked to collaborate on a project for Sargento and we’ve stayed in touch ever since. Unlike most books on creativity that tell you to unleash your inner child or think like da Vinci, Idea-Links presents a straight-forward, step-by-step process by which anyone can develop more and more importantly, better ideas for the challenges they face. The whole concept of Idea-Links is pretty simple. Observe what’s going on around you. Analyze those observations so you understand why they work. Then store that information in a way that allows you to easily retrieve it when you’re trying to solve a problem. This made so much sense to me, because whether it’s been commercials I’ve produced, products I’ve developed or songs I’ve written, the ideas, though hopefully original, never really came out of nowhere. They were always inspired by some bit of knowledge that had been rolling around in my brain. Idea-Links demonstrates how to do this in a more systemic and disciplined way, rather than just waiting for serendipity to run it’s course. I’ve read a lot of books on creativity – Gordon McKenzie’s Orbiting the Giant Hairball, Robert Sutton’s Weird Ideas that Work, Seth Godin’s Purple Cow, etc. – and while they’re all inspiring, Idea-Links is most useful book on creativity I’ve come across. Only make promises you’re prepared to keep. 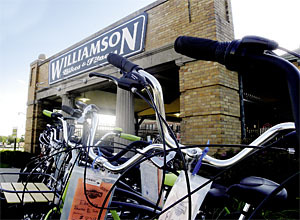 A friend of mine, driven by the desire to shop at a locally-owned business and swayed by the promise of a free tune-up within one year of purchase, spent nearly $2,000 on a new bike at Williamson Bicycle Works last year. Willy Bikes as they’re called by the locals, has been around forever. The founder has a great reputation for taking care of customers, but clearly something has changed. When my friend called to set up an appointment for his tune-up he was told they were too busy to take appointments over the phone. He would have to bring the bike in, leave it for a day and only then would they give him an estimate and schedule an appointment sometime next month. After explaining that he lives 30 miles away and he just wanted an appointment for his complimentary new bike tune-up, the tech reiterated, “No. Bring it in, leave it for a day and then you will get an appointment next month.” and then hung up. Customer service is about making things easy for customers, not you. The service process that Willy Bikes designed may work for the company – allowing them to control employee schedules and inventory – it clearly doesn’t work for the customer. Yes, we know you’re busy assembling new bikes, getting the shop ready for the season, and handling lots of calls from people who want service. But that shouldn’t be a surprise to you because after all, it is spring and you’re always busy this time of year. That’s your problem, not your customers’. You promised free tune-ups to people who purchased bikes last year and you have to give them within a reasonable time frame or expect your customers to be unhappy. If that means adding a few techs who are dedicated to doing just that for a few weeks out of the year then so be it. Marketing gets you customers, service keeps it. Make sure you design your after-sale service to meet your customers’ needs or be prepared to lose them. Five ways to make Twitter work for you.